Pickford local soprano Karen Hughes will be singing in A Grand Night for Singing: Opera and Broadway Favorites. Tenor Dr. Christopher Hollingsworth, soprano Rosemary Hollingsworth, pianist Rachelle Deresti, string quartet Simply Strings, and local talent will be joining Hughes. A Grand Night for Singing will have pieces from Wicked, My Fair Lady, La Traviata, Così fan tutte, and pieces from Die Fledermaus, an opera that is being performed at the Soo Theatre Project in September. Tenor Dr. Hollingsworth has performed leading and featured roles in Don Giovanni, Così fan tutte, The Magic Flute, Le nozze di Figaro, Madama Butterfly, Roméo et Juliette, La Traviata, Die Fledermaus, and others. Dr. Hollingsworth is currently an Assistant Professor of Voice at Illinois State University where he serves as Coordinator of the Voice Department. Soprano Rosemary Hollingsworth has performed leading roles in Tales of Hoffman, Don Giovanni, Die Fledermaus, The Magic Flute, Roméo et Juliette, Kismet, Così fan tutte, and The Medium. Ms. Hollingsworth has served on the voice faculty of Illinois Wesleyan, Lycoming College, and Illinois State University. 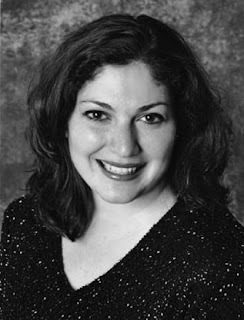 Soprano Karen Hughes has performed extensively in opera, musical theatre, and oratorio in the United States and abroad. Hughes will head to Italy this summer to sing the Countess in The Marriage of Figaro with La Musica Lirica in July. Hughes holds a Bachelor’s Degree in Harp Performance from DePauw University and Master’s Degree in Vocal Performance from the University of Nebraska. Pianist Rachelle Deresti holds a Bachelor of Music Degree in Piano Performance from the University of Saskatchewan and a Master of Music Degree in Piano Chamber Music from the University of Toronto. Rachelle returns to the Soo Theatre for Grand Night, having been the rehearsal accompanist for The Magic Flute and the pianist in the orchestra for Annie. Rachelle teaches piano at the Algoma Conservatory in Sault Ste. Marie, Ontario. 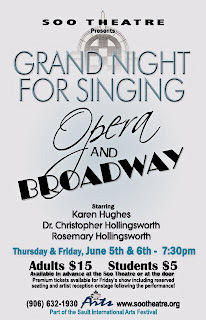 A Grand Night for Singing: Opera and Broadway Favorites is being performed at the Soo Theatre Project on Thursday, June 5th and Friday, June 6th at 7:30 p.m. Tickets are $15 for adults and $5 for children 12 and under. There will be a June 6th Special: $30 tickets for the middle section towards the front will include an after-performance on-stage reception to meet the artists. Wine, punch, coffee, and light appetizers will be provided. For advance tickets or more information, call the Soo Theatre office at (906) 632-1930. The Soo Theatre is located at 534 Ashmun Street in Sault Ste. Marie, Michigan. Back by popular demand, WWII Revue is being performed in Soo, Michigan. Recently performed in Soo, Ontario, this performance showcases the great talents of the Northland Barbershop Chorus and the Lock Cities Chorus of Sweet Adelines. Both choruses are known for their harmonies and energetic stage presence. The show is a salute to all veterans, especially those who served in WWII, with a night of song and skits. All of the WWII greats will be there: FDR, Bob Hope, Carmen Miranda, Kate Smith, and more. There will also be an authentic tank parked in front of the Soo Theatre Project as another form of commemoration. 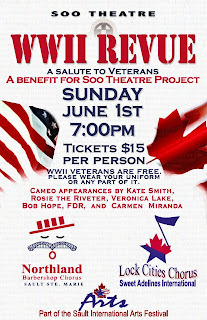 The WWII Revue will be performed at the Soo Theatre on Sunday, June 1st at 7:00 p.m. Tickets are $15 and WWII veterans have free admission. Photos of Soo Theatre's WWII "Makeover"
STARS Summer Classes Start June 2; Sign Up Now! 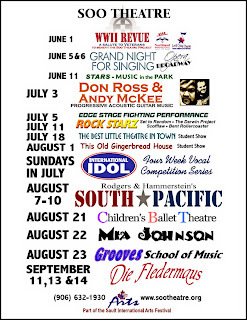 Registration is now open for summer classes at the Soo Theatre Arts Resource Studios (STARS.) The summer term begins June 2. Classes, workshops, lessons and day camps for children, teens and adults are offered in dance, music, acting, visual arts and yoga. Brochures listing class time and tuition fees are available at the STARS office or online at www.sootheatre.org. Interested students should register in person at the STARS office weekdays 10 am to 6 pm. Arts Day Camps for children and teens will be offered during July. Musical theater camp for middle school and high school students will be July 7-18, concluding with a performance of “The Best Little Theater in Town.” Elementary musical theater camp will be July 28-August 1, concluding with a performance of “This Old Gingerbread House.” Elementary arts exploration camp will be July 21-25. Class offerings in dance include Movement & Dance, Pre-Ballet, Ballet I, II, III & IV, Pre-Pointe and Pointe, and Footlights Dance Company. All dance classes are taught by Dianna George. 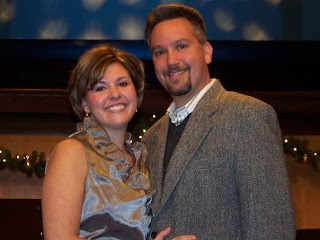 Ronda McGreevy will be teaching Beginning Piano Classes for ages 9-12, 13-16 and adult. Tunes for Toddlers, parent-child music classes for preschoolers, will be offered by Nancy Powers. Chamber Music, Fiddle Club and “Not Quite Ready for Prime Time” Players offer ensemble opportunities for string players of all ages. Lee Carlson will teach yoga classes for adults. Meg Stevens will lead the Flute Choir. Stage-fighting Workshop for teens will be offered June 30-July 5. Private lessons will be available in violin, viola, cello, flute, clarinet, voice and piano. STARS summer arts camps are supported in part by a grant from the Michigan Council for Arts and Cultural Affairs. Roll over Beethoven and get jiggy with it. 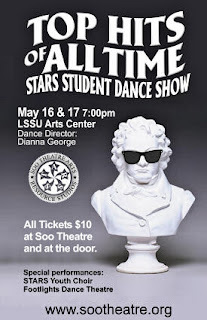 Students of the Soo Theatre Arts Resource Studios (STARS) and Ms. Dianna George are taking to the stage at LSSU's Arts Center on May 16 and 17. Over 150 students of ballet, ballroom, hip-hop, jazz, and tap will wow audiences with choreographed moves to some of the greatest hits from the last 200 years. The show will open with special guests, the STARS Youth Choir, singing a couple of numbers, and then the dancers will take to the limelight. Performers range from 3-year-olds doing what they do best--acting incredibly cute--to teens and adults who have been honing their talents for years. Audiences will also be regaled with the inaugural performance of the Footlights Dance Theatre, a cadre of highly skilled dancers who will be touring the Eastern Upper Peninsula this summer. Showtime is 7 p.m. both nights. Tickets are $10 for all seats and can be purchased at the Soo Theatre offices (534 Ashmun Street, Sault Ste. Marie, Michigan) or at the door. Soo Theatre Project, Inc. announces its summer 2008 season of programs at the Soo Theatre, 534 Ashmun Street, Sault Ste. Marie, Michigan. Tickets will be available starting May 1. All tickets are available at the Soo Theatre offices and at the door. Discounts may be available for groups of 20 or more. Please call Jack or Lola at (906) 632-1930. Printable PDF versions of ticket information (15Kb) and poster at right (492Kb) are available on the website. WWII Revue performed by Northland Barbershop Chorus & Lock Cities Chorus of Sweet Adelines. 7:00 p.m. Tickets: $15 everyone, WWII veterans free. A Grand Night for Singing (Broadway and Opera favorites). 7:30 p.m. Tickets: $15 adults, $5 children 12 and under. June 6 Special: $30 tickets for the middle section towards the front include an after-performance on-stage reception to meet the artists. Wine, punch, coffee, and light appetizers will be provided. Don Ross & Andy McKee. Don Ross is the only person to ever win the U.S. National Fingerstyle Guitar Championship, twice! Andy McKee is YouTube’s #1 Most Downloaded Artist. 8:00 p.m. Tickets: $22 adults, $18 students of STARS, Grooves Music, and Steve’s Music. E.D.G.E. (stage fighting performance). 7:30 p.m. Tickets: $5 everyone. International Idol (vocal competition series). 6:00 p.m. Tickets: $5 everyone. Rock Starz (four local rock bands). 5:00 p.m. Tickets: $10 everyone. The Best Little Theatre in Town (middle/high school musical performance). 7:00 p.m. Tickets: $5 everyone. Elementary School Arts Exploration Camp Open House. 2:00 p.m. Free admission. This Old Gingerbread House (elementary school musical performance). 2:00 p.m. Free admission. South Pacific (Rodgers & Hammerstein musical). August 7-9 evening performances: 7:30 p.m. Tickets: $18 adults, $12 children 12 and under. August 10 matinee: 2:00 p.m. Tickets: $15 adults, $10 children 12 and under. Mia Johnson (acoustic guitar and cello duo from Philadelphia). 8:00 p.m. Tickets: $10 adults, $8 students of STARS, Grooves Music, and Steve’s Music. Die Fledermaus (Johann Strauss II opera). September 11 and 13 evening performances: 7:30 p.m. Tickets: $18 adults, $12 children 12 and under. September 14 matinee: 2:00 p.m. Tickets: $15 adults, $10 children 12 and under.